The Education Division of the Taipei Economic and Culture Office (TECO) in Houston will administer the 2018 Test of Chinese as a Foreign Language (TOCFL) on Saturday, April 7, 2018 at the University of Houston – Downtown 【 One Main Street, Suite GSB311 (3F, Girard Street Building), Houston, TX 77002 / phone: 713-221-8027】. The TOCFL is intended for those that wish to measure their Chinese proficiency and is available in both traditional and simplified character versions. Since 2014, the levels of the TOCFL have been reformed in order to correspond to the CEFR (Common European Framework of Reference for Languages: Learning, Teaching, Assessment). The new version of the TOCFL has three proficiency bands: Band A, Band B, and Band C. Each of the bands has two levels. According to the AP Course Description, “Course work provides students with opportunities to perform Intermediate- to Advanced-level tasks, and students are expected to achieve proficiencies throughout, and sometimes beyond, the Intermediate range, as described in the American Council on the Teaching of Foreign Languages (ACTFL) Proficiency Guidelines.” Therefore, if the students want to pass the AP test, they have to reach the intermediate level of the ACTFL Proficiency Guidelines, which corresponds to level 3 of the TOCFL. The students could take the TOCFL as a practice test for AP test preparation. Becoming eligible for the “Taiwan Scholarship” and “Ministry of Education Huayu Enrichment Scholarship” sponsored by the government and for studying in Taiwan. Qualifying for admission to academic programs at colleges or universities in Taiwan. Serving as a job-required proof of Chinese language proficiency for individuals who wish to obtain Chinese-inclusive, bilingual employment globally. TOCFL will be administered via the Internet. There are two sections (listening and reading) which take a total of about two hours to complete. Please see http://www.sc-top.org.tw for the mock-test. Registration is accepted from February 14 to March 8, 2018. Please register at the website: https://usa.sc-top.org.tw/. In order to complete the registration process, please print out the registration form and mail it along with the registration fee to Education Division, TECO in Houston (11 Greenway Plaza, Suite 2012, Houston, TX 77046) before 03/08/2018. The registration will be cancelled if the examinees fail to submit the registration fee before 03/08/2018. Required documents and fee are as follows. If any accredited organizations or Chinese schools are willing to administer a group test, please contact the Education Division of the Taipei Economic and Culture Office in Houston beforehand. Please direct all questions to the Education Division of the Taipei Economic and Cultural Office in Houston at 713.840.3854 or brownie.ch@mail.moe.gov.tw. 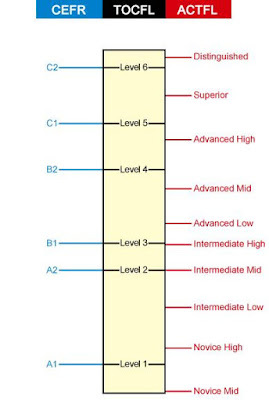 The proficiency levels of TOCFL in corresponding relationship with CEFR and ACTFL Proficiency Guidelines.